Leica announces the Leica V-Lux 3, the all-in-one super-zoom camera for creative stills and video. 8 December 2011: Leica Camera AG has today announced the Leica V-Lux 3, a versatile all-round compact camera with a 24x optical zoom lens, designed for photographers shooting landscapes, portraits, architecture or wildlife, as well as sports and fast-moving subjects. Perfect for travel photography where flexibility is vital, the V-Lux 3 features a Leica DC Vario-Elmarit 4.5 – 108mm f/2.8 – 5.2 ASPH. super-telephoto zoom lens with an enormous range of focal lengths equivalent to 25–600mm in 35mm format, making it ideal for almost all photographic situations. A newly-developed 12.1 megapixel CMOS sensor ensures exceptional image quality, performing particularly well in low light and at high speeds. The high contrast, low noise, and rich and natural colours delivered by this sensor set new standards in a camera of this class for both still images and movies. Furthermore, the V-Lux 3’s high-speed continuous shooting function (12 frames per second at full resolution, or 60 frames per second at a resolution of 3.5MP), make it one of the fastest burst-shooting cameras in its category. In addition to still image functionality, the Leica V-Lux 3 offers an extensive range of video options and exceptional quality comparable with premium-range camcorders, capturing full HD video in AVCHD format with 1920 × 1080 pixels and 60 full frames per second, known as 1080p60. This video format not only guarantees the perfect rendition of fast movement with outstanding detail, but is also ideal for conversion to alternative resolutions and refresh rates. In addition, the V-Lux 3 can record footage directly in MP4 format, which can be used directly on mobile devices and on the web, conveniently and without conversion. The entire 24x zoom range is available during video recording, and an integrated stereo microphone with an electronic wind noise filter guarantees a crystal-clear soundtrack. from above the head or close to the ground, the photographer remains in full control. Characterised by its ergonomic, compact design and extremely simple handling, the V-Lux 3’s integrated handgrip and light weight allow the photographer to produce outstanding images in all situations, including one-handed shooting. The camera controls are clearly laid-out, enabling fast and easy operation. For example, video recording can be started and stopped at the touch of a button on the top of the camera. For maximum protection of the Leica V-Lux 3 in outdoor conditions, a strong, black camera case will be available as an optional accessory. The case is made from the same hard-wearing and water-repellent material used for convertible roofs in the automotive industry. 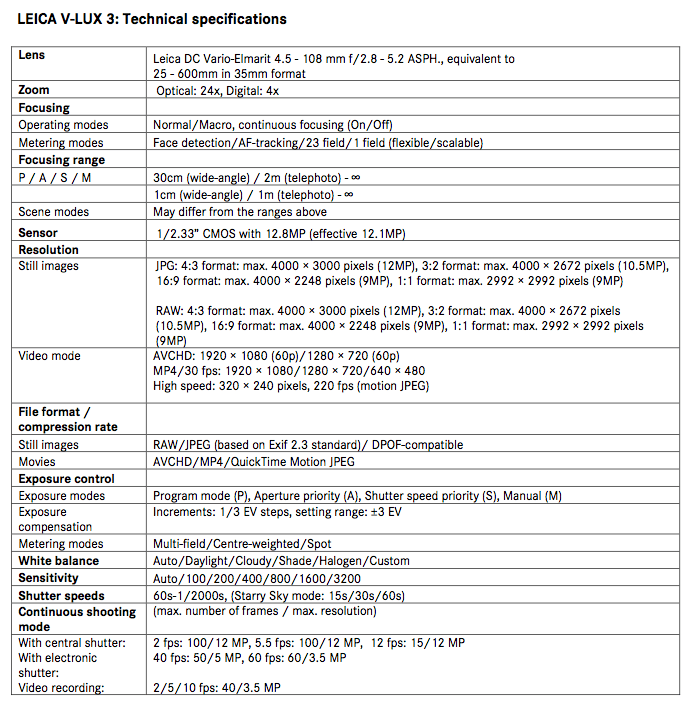 The Leica V-Lux 3 is supplied with a comprehensive suite of software. Adobe® Photoshop® Elements® provides users with a comprehensive and versatile image editing solution that offers viewing, organisation and a wide range of processing options for still images in compressed or RAW format. Also included is Adobe® Premiere® Elements®, an easy-to-use package offering video processing for movie files recorded by the V-Lux 3 in AVCHD format, and also enabling the creation of professional audio and video effects. Both programs are available as free downloads from the Leica web site after registration of the camera. The Leica V-Lux 3 comes with a two-year warranty and a one-year Leica UK ‘Passport’ (complimentary accidental damage cover). UK customers are also welcome to visit the Leica Store and Akademie in Mayfair, London, for a complimentary demonstration or training session on the features of the camera. Technical support by telephone is available via Leica’s London-based Client Care department. The Leica V-Lux 3 is scheduled to be available in the UK from January 2012 from authorised Leica dealers including the Leica Store Mayfair: www.leica-storemayfair.co.uk, tel: 020 7629 1351. A full list of authorised UK Leica dealers is available at www.leica-camera.co.uk. 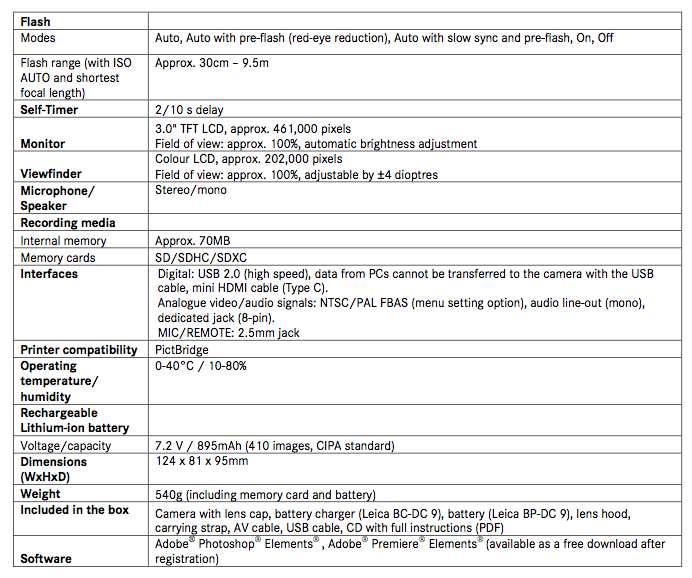 The suggested retail price of the Leica V-Lux 3 is £690 inc. VAT. The black outdoor case will be available at an SRP of £135 inc. VAT. Info sourced at Leica Press Release. All images and copyrights reserved. No reproduction allowed without previous authorization.